Since the first publication of this report in 1993, education in the field of Medical Physics has experienced considerable growth and change. However, much remains the same. 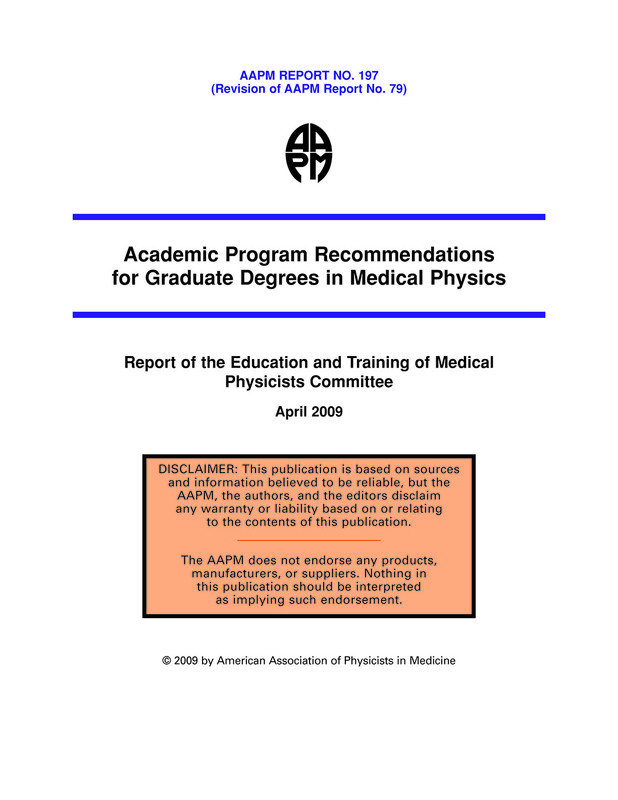 The original document was written to provide guidance to medical physics training programs as to the mini- mal curriculum suitable for a Master of Science degree in medical physics. That document was organized around general topics and those more specific to different medical physics specialties. During the intervening years, medical physics has evolved dramatically in breadth and depth. This evolution has led to the need for a revision of the prior recommendations and the creation of the present document. In this document, we more strongly reflect the relationship between a core curriculum that all medical physics Masters (M.S.) and Doctoral (Ph.D.) trainees should be well grounded in and the more specific aspects associated with the medical physics subspecialties. Clearly, the core curriculum serves as a basis for these more specific topics. For example, basic interactions physics is essential to all of radiation oncology, diagnostic radiology, nuclear medicine, and health physics. To some degree image science is required knowledge for any medical physicist, but details of magnetic resonance (MR) image science are, for example, more pertinent to the specialist. We also now recognize the importance of biostatistics, medical informatics, and med- ical ethics. The current clinical and research environment makes these essential tools for any practicing medical physicist. As indicated in the Table of Contents, Core material includes Radiological Physics and Dosimetry, Radiation Protection and Radiation Safety, Radiobiology, and Anatomy and Physiology, and a sequence of Special Core Topics that make up a knowledge base of divergent materials. The latter include Computational Skills, Medical Ethics, Statistics, Safety, and Clinical Research and Scientific Communication. As mentioned, the former are essential to all medical physics training and serve to act as a basis for more subspecialty training. The latter incorporate a knowledge base needed by all medical physicists but to a less comprehensive level. In fact, we anticipate that some of these subjects may have been covered in prior training. However, recent experience indicates that Medical Ethics and Statistics may require more in-depth coverage. During the next several years, the American Association of Physicists in Medicine (AAPM) will be monitoring the needs in these areas. In addition to these Core (and Special Core) subjects, the two broad subspecialties, Imaging Physics and Radiation Therapy Physics, are recognized. However, it is also acknowledged that these two subspecialities overlap in important areas, especially in areas of image-guided therapies and treatment planning. For each area, a sequence of appropriate sub-subjects is indicated, but there is a growing need for a general course in cross-sectional imaging that would include basics of contrast mechanisms, linear system theory, image reconstruction, and digital image processing as it applies to image guided procedures. For Image Science specifically, a basic course in the fun- damentals of imaging in medicine is added to introduce students with an imaging subspeciality to the general concepts of image science, including the inverse problem, signal processing, digital image processing, image perception and quantitation. This is followed by modality-driven mate- rial that allows the imaging student to dive more deeply into the physics and systems engineer- ing of the various modalities. It is noted that there is a growing body of research applying functional imaging procedures for therapy monitoring that requires quantitative imaging methods and attention to reproducibility of image measures that may eventually find application in clinical practice. Similarly, “molecular” imaging techniques in modalities other than existing methods in nuclear imaging may also become clinically important. However, additional time will be required to gain perspective on how these emerging fields will impact the practicing medical physicist. For Radiation Therapy Physics, the sub-subjects are treatment regime and device driven. There is a need for an introductory applied image science course for those in the Radiation Therapy sub- specialty. For both Imaging Physics and Radiation Therapy Physics, training programs may implement the curriculum in different ways, combining topics, redistributing topics, and using other means to achieve the desired educational end. However, we anticipate that all the material will be presented. We also anticipate that programs may choose to specialize in one or the other area providing even more extensive training. However, the essentials, as indicated, are needed for all programs. Amongst programs accredited by the Commission on Accreditation of Medical Physics Education Programs, Inc. (CAMPEP), there is a common core of similarity, yet each program reflects the individual strengths and resources of personnel and facilities. As more programs have been granted CAMPEP accreditation, these guidelines for training are essential to ensure that the minimal curriculum represents the current needs of medical physics. The present docu- ment embodies these principles and serves as the basis of CAMPEP accreditation. Beyond the foregoing, we anticipate that some of this training might be provided in earlier academic experiences, e.g., a Bachelor of Science (B.S.) degree or an M.S. degree in a related field. Individual departments can give credit (when appropriate) to incoming students with pre- vious course work that fulfills didactic MP training requirements. An extensive bibliography of suggested resources is included. Again, selections are segregated by topical area. Entries are often duplicated as appropriate. A special question concerns “clinical” training. Ultimately, a majority of medical physicists practice their training in a clinical environment. The combination of prior didactic clinical train- ing and experience should eventually lead to “certification” or “licensure.” Without excessive elaboration, formal academic training can never hope to provide, nor is it necessarily the proper environment for, this clinical training. The best mechanism is embodied in residency training. Such training programs are now being accredited by CAMPEP.